Using Rhino 3D modeling and CAD/CAM software participants will explore the various methods of digital fabrication and how it affects the design process based on those guidelines. 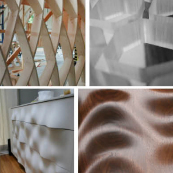 The five scenarios that dictate the fabrication process are Slice, Fold, Tile, Skin, and Carve. This two-day workshop will cover the various types of digital fabrication and what advantages each process can offer. It will detail the proper setup techniques, both in the field, and on the computer, as well as basic software and formatting tutorials.